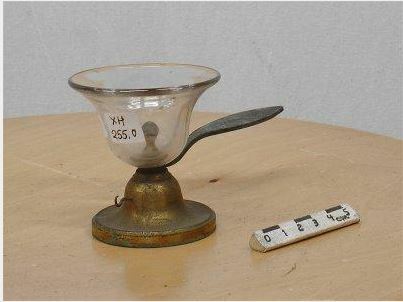 Brass circular base which supports a small hook on one side and an elongated grip on the other side. At the top, a brass bead penetrates a hemispherical bowl of thick glass. The bowl has a flared top. 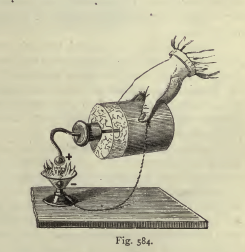 A flammable essence is placed in the bowl. We connect the two armatures by a Leyden capacitor, the one hand at the outer ring and the other in the center of the bowl. As a result, the essence is blazed up, when the spark bursts.